Tom Cue of Cue, WA. 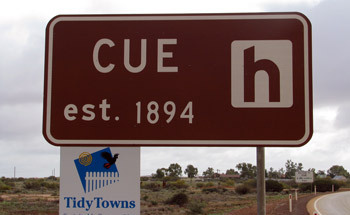 The town of Cue in Western Australia is named after Tom Cue. These notes attempt to provide factual information about him and his family. His father was George Cue who was sometimes referred to as Thomas George Cue but not in any records we have found. George Cue served as a midshipman on HMS Lapwing under his uncle Sir Thomas Ross (1797-1874). Before settling in Australia he went to America. It is likely that George Cue arrived in Melbourne on the 11th December 1850 on the ship Royal George from London via Adelaide: “George Cue, wife and five children”. These five children probably included Anne, Kate and Tom. He settled in Melbourne in 1850 and then moved to Casterton, possibly in 1853. In 1867 George Cue, the clerk of petty sessions in Casterton was appointed to act also as the clerk to the petty sessions in Digby. In 1875 George Cue was appointed Assistant Registrar in Casterton to the County Court in Hamilton. George Cue died in April 1897 and was survived by two sons (Tom and Richard) and seven daughters (Anne, Kate, Eva, Elizabeth, Frances, Georgina and one unknown). Note: The Argus reported on 20 February 1877 that a meeting of the creditors of the estate of TG Cue, a store keeper of Casterton would be held the following day. A photograph of the premises of TG Cue & Co is on the Museum Victoria website. The meeting was said to have been called by TG Cue and that he had debts of £14,000. At the meeting the deficiency was recorded as £3,432. Who was this TG Cue? Tom Cue’s mother was Maria Theresa Cue nee Collins. George and Maria married in County Cork in Ireland in 1844. Maria died in 1883 in Victoria. The death index record states that she was aged 59 at the time of her death and that her parents were Thomas Collins and Mary McCarthy. The death was registered in Casterton, Victoria. I have not found any mention of her death by searching Trove Newspapers. She is buried in an unmarked grave in the old Casterton Cemetery and the year of her birth is given as 1824. Anne Cue, the eldest daughter of the late George Cue of Forest Farm, Casterton died age 63 (or 64) on 8th March 1908 in Port Fairy. Mother listed as Maria Collins. Age at death suggests she was born about 1845. Mr W S McPherson is mentioned as Tom Cue’s brother in law in the Portland Guardian of 5 January 1894. Kate Cue (born Cork, Ireland) married William Sutherland McPherson (about 1849 - 1922) in 1873 . She is said to be the third daughter. She died in 1917 aged 69 in Port Fairy. Age at death suggests she was born in 1848. Six sons and two daughters survived the death of William. Richard Alexander Cue was born in Kilmore Victoria in 1852 and died in 27 October 1942 aged 90 in Heidelberg, Victoria. He was a Bank Manger with the Union Bank. He married Esther Mary (or Maria) Broad nee Tijon in Kilmore Victoria in 1897. An unnamed female child born to George and Maria was registered in 1854. Eva Grace Cue died in Cheltenham in April 1937 aged 81. Parents shown as George Cue and Maria Collins. She would have been born about 1856. Elizabeth Cue died in Casterton in 1927 at age 70. Parents shown as George Cue and Maria Collins. As she died at 70 she would have been born about 1857 and so she could be the unnamed female born to George and Maria in 1858. Margarita Cue died in 1872 in Casterton aged 13. Her age suggests she was born to George and Maria in about 1859 so she also could have been the unnamed female born in 1858. Buried Sandford Cemetery. Frances Morgan died in 1940 aged 78. Parents shown as George Cue and Maria Collins. She was buried in the Casterton Cemetery. Frances Ann Cue married Dan Walt Morgan in 1913 in Melbourne. She was born about 1862. An unnamed male was born to George and Maria in 1863 and died the same year aged 1 day. He was buried in the old Casterton Cemetery. The grave is unmarked. A Georgina (Gina) Cue died in 1933 in Port Fairy aged 85 parents shown as George Cue of Casterton and Ann Ross. Ann Ross was probably Gina’s paternal grandmother. No record of Tom’s birth has been found as yet. There seems no reason to doubt that he was born County Cork, Ireland as indicated on the records for his marriage, 1911 census record and death. This would mean that he was born before the family left for Melbourne in 1850. The discovery of gold at Cue probably went something like this. The details are not fully recorded. Michael John Fitzgerald and Edward Heffernan were prospecting for gold on Roberts and Townsend's Coodardy Station in 1892 and found a nugget weighing 144 ounces. An aboriginal nicknamed Governor employed by Townsend pointed out two more nuggets one weighing 24 ounces and the other 25 ounces. They asked Tom Cue to register a claim which he did with the mining warden at Nannine. That is why Tom Cue is sometimes referred to as the discoverer of gold at Cue. Tom Cue was often referred to as an "old Broken Hill" identity or as "TG Cue of Broken Hill". Tom Cue is said to have made his richest find in 1895 about ten kilometres north of Lawlers in Western Australia. He named his gold mine The Woronga and he had other leases in the area. The area became known as Cue’s Patch (or more simply The Patch) due to the rich patch of alluvial gold. To avoid confusion with the town of Cue, Cue's Patch eventually became known as Agnew. The first official train to steam into Cue following the completion of the Mullewa to Cue Railway in 1897 was hauled by the "Tom Cue". The train arrived at the Cue station at 2:30pm on 20 April where a crowd of 1500 people were assembled. The Cue Brass Band played "God Save the Queen". Tom Cue took part in the festivities. Eugenie Spencer Wills was born in January 1854 and was the daughter of Horatio Spencer Howe Wills and Elizabeth Wills nee Wyre of Cullin-la-ringo Queensland and Bellevue, Geelong. Eugenie Wills married Peter Tyson in November 1877 in Victoria. The birth of one child to the marriage, Eva J Tyson was registered in NSW in 1892. No other children have been found to this marriage. Eva's surname was subsequently changed to Cue. She died in July 1972 in Prahran, Victoria, Australia. Eugenie petitioned for a divorce from Tyson on the grounds of desertion. The divorce was granted in NSW in July 1895. Tom married Eugenie Spencer Tyson in Vancouver, Canada on 16th July 1900. They returned from overseas on the White Star Liner Afric in Febuary 1902. Tom and Eugenie were shown living in Wallace Street, Toorak on the 1903 Commonwealth Electoral Roll. The death of Eugenie occurred on 8 July 1937 and was recorded in The Argus (10 July 1937), where she was described as the widow of Tom Cue of Cue W.A. Early in 1911 Thomas Cue travelled from Southampton to British Columbia on the George Washington. In the English census of 1911 (11 April), Tom gives his occupation as a mining engineer. He is living at 10 Frognal Mansions, Hampstead (now in the London Borough of Campden) with his wife Eugenie and his "daughter" Maizie (that is Eva). In 1912 the three of them were in the USA and Canada. Thomas George Cue died in Vancouver, Canada on the 4th September 1920. Web page Inscription List for Casterton Old Cemetery. Accessed 10 July 2013. Web page (Museum Victoria) Negative - Casterton, Victoria, pre 1880. Accessed 10 July 2013.